The Clarets secured another point in their push for European football, securing a 1-1 draw at the Britannia Stadium, but it seems that their route in the competition will now be through the qualifying rounds. For a spell, with Arsenal being held by West Ham United at the Emirates, it appeared that sixth spot was still up for grabs only for the Gunners to end the game in style. A 4-1 win against the Hammers, which came courtesy of Alexandre Lacazette's double and an Aaron Ramsey strike in the last eight minutes, saw the gap between sixth and seventh open up to four points while Arsene Wenger's men have a game in hand. Boss Sean Dyche wasn't best pleased with the officials when Badou Ndiaye gave the Potters the lead in the 11th minute. Whether the linesman had flagged for a free kick on Ashley Westwood for a pull on the shirt by Xherdan Shaqiri, or whether he had pre-empted a throw in, still needs to be clarified, either way referee Mike Dean allowed play to continue and the Potters profited. Glen Johnson hit the flank, with Joe Allen at the other end, and it was the Welshman's cross that caught the Clarets cold. Ndiaye won the initial flick, Mame Diouf was afforded the time to return the ball to his team mate, and the Senagalese midfielder, signed from Galatasary in January, beat Jack Cork on the edge of the box before squeezing an effort, via a deflection off Kevin Long, inside the post. 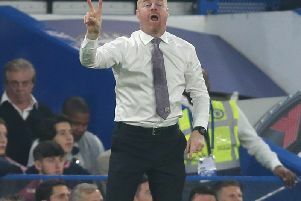 Burnley have mixed their football up well this season to adapt to the demands of the Premier League and it was their direct approach after the home side's opener that almost paid dividends. Barnes was on the end of Westwood's diagonal and, with Stoke City skipper Ryan Shawcross obstructing his view of goal, the striker bent an effort around the post. The Clarets found feet with their next exploration in to the Potters half and Chris Wood, who did well to hold off Bruno Martins Indi after collecting Stephen Ward's pass inside the penalty area, drew a save from Jack Butland. Diouf, who only has two goals in his last 18 appearances in the top flight, had a couple of chances to extend City's lead but his composure in front of goal mirrored that of a forward struggling for confidence. The former Manchester United and Blackburn Rovers striker didn't give Nick Pope enough to do when meeting Shaqiri's sweeping cross with a stooping header and then he fluffed his lines when letting Moritz Bauer's delivery slip through his legs in front of goal. With England coach Gareth Southgate moving closer to finalising his squad for this summer's World Cup in Russia, it seems a couple of the three goalkeeping spots are still up for grabs. One of those could turn in to a battle between Pope and Butland and both did their chances no harm throughout this fixture. The latter pulled off an excellent save to deny Johan Berg Gudmundsson, springing to his right hand upright to push the ball away having had his vision of the Icelandic international's free kick obscured by his wall. Burnley caused the hosts all kinds of problems in the second half and were unfortunate not to take all three points after Barnes's equaliser. After Butland kept out headers from Jack Cork and James Tarkowski, the away side drew level just after the hour. The Potters goalkeeper did exceptionally well to keep out Tarkowski's close range header from Westwood's delivery but, using his predatory instincts, Barnes followed up to bundle the ball over the line to score his ninth league goal of the campaign. Paul Lambert's side needed maximum points to realistically keep their hopes of survival alive and Shawcross should have given them a boost from Shaqiri's corner. The defender peeled away from his markers to meet the set-piece but somehow managed to steer his header wide of the far post from the edge of the six yard box. Substitute Stephen Ireland went even closer late on when collecting the ball on the edge of his box but the 31-year-old's delicate strike clipped the outside of the post. However, it was the visitors that almost wrapped things up in the closing stages and it was Gudmundsson who at the centre of the grandstand finish. The one-time Charlton Athletic winger, who has previously featured in the Europa League for AZ Alkmaar, had one attempt beaten away by Butland after cutting inside, another grazed the woodwork before a third travelled just beyond the post with Butland beaten.